Everybody’s Scalin’ For the Weekend – Video Episode #1 Featuring an Axial SCX10 and Gmade Sawback « Big Squid RC – RC Car and Truck News, Reviews, Videos, and More! This week I’m taking a break from the standard “written” column to debut a new YouTube video series. I’ll be doing an episode about once a month and will try to give it a “Wide World of Sports®” vibe that covers all different areas of scale rc (trails, monster trucks, drag racing, sand rails, hill climbing, etc). This first video features both my modified RECON G6 edition Axial SCX10 and bone stock Gmade Sawback. Myself and good friend Mike Ewens took them to the banks of the Missouri River for some wooded trailing and had a blast on a very chilly day. A couple pieces of housekeeping before we go. In case you missed it earlier this week I started a build series converting an Axial Deadbolt into a high flying mega truck. Part 2 should go live early next week. I’ve been testing the truck and it’s a beast! Also, do you have a cool build/ride that you want to showcase to the scale community? 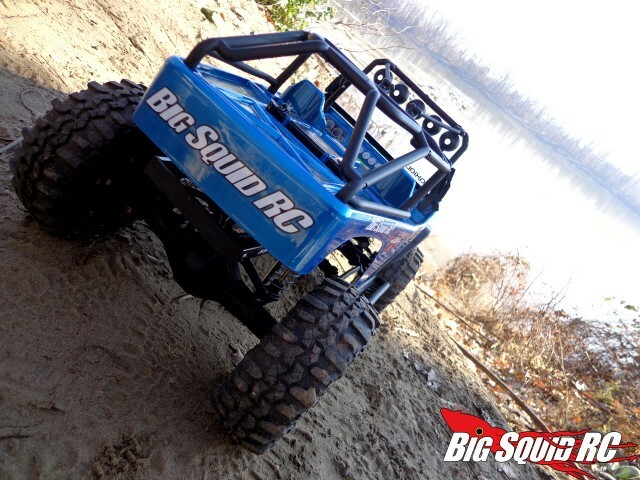 Shoot an e-mail to showmescalers at gmail dot com and if you have some pretty pictures of your rig doin’ work you could see it right here (and score a few Big Squid RC stickers to boot). I’d also like to thank all the readers who have thus far been reading my scale ramblings every Friday. I have quite a bit planned as far as builds, event coverage, and how-to’s for 2014….if it would ever stop snowing! It’s getting to the point where if I ever plan on getting outside again I’m going to need to build a Kyosho Blizzard. Hmm, a Blizzard does sound pretty cool, right?